In her article “Visual Pleasure and the Narrative Cinema”, Laura Mulvey describes a way of analyzing and understanding cinema from a feminist and psychoanalytic perspective. A very similar approach is taken by Molly Haskell in her review of Hitchcock’s Vertigo. The highly Freudian approach described by Laura Mulvey is not necessarily obvious or relevant in every film and genre, but it is very helpful in understanding Billy Wilder’s Double Indemnity, which vividly illustrates some of the points made by both Laura Mulvey and Molly Haskell. There is no doubt in Double Indemnity, that Phyllis Dietrichson, the dissatisfied wife of a wealthy older man is being sexually objectified both by the imagery of the film and by her position in relation to the other characters. She is a beautiful and alluring woman, barely older than Lola, her husband’s daughter from a previous marriage. It is clear she has no true affection for her husband, especially when she begins to plot his murder in the hope of getting his insurance money. It is also fairly obvious that his reason for marrying her was little more than a shallow attraction to her looks. He has little respect for her as a human being, as evidenced by her own complaints on the subject, and consistently places his daughter’s well being above his wife’s. This frame of mind is made most obvious in his decision to insure his life in Lola’s name. In the case of his death, Lola will get everything, and Phyllis will be left penniless. The sad truth is that he couldn’t care less what happens to Phyllis after he dies. Lola is his family, his flesh and blood, and he wants to make sure she will be well provided for. Phyllis on the other hand, is not a human being. She is a beautiful plaything, an expensive possession, a walking work of art to be looked at and shown off, but definitely not entitled to a life of her own. When Dietrichson is no longer around to enjoy her, she may as well cease to exist. He feels no need to provide for her after his death. Although he is mostly absent from the film (in a physical sense), we can still feel the type of look he casts on his new wife from her own words and from an analysis of her position in the family. His admiration of her physical attractions seems to be on the borderline between what is described by Mulvey as “fetishistic scopophilia” and voyeurism.1 He is incapable of accepting the obvious evidence pointing to the fact that this beautiful object murdered his first wife, she is blameless by default because she is beautiful and desirable. On an even darker level, she is definitely more desirable than his ill, older wife, and therefore serves as a welcome replacement. At the same time he does not quite elevate her to the level of divinity. She is still an object that he wants to possess, to have power over, so that she will always be there for him to look at. Not surprisingly, he is not the only male character to view her this way. Describing their first encounter, Walter Neff, the narrator and central male figure of the film, immediately verbalizes the way Phyllis is meant to be perceived both by the male characters and by the audience. His eyes, along with the camera, are immediately drawn to her curvaceous figure, her tight-fitting clothes, and her tempting anklet. The camera follows his lustful gaze giving a long close-up of the anklet in question. Phyllis becomes “a cut-out or icon” as described by Mulvey.2 Her body is taken apart into sections like a bar of chocolate to be separately viewed and savored by Walter and the audience. Again she is not given the dignity of being an entire person. Walter is instantly drawn to her, not out of compassion for her predicament, not out of admiration for her wit or her audacity, but out of pure lust. But what about Phyllis herself? Is she really an object or a human being, and to what extent does she attempt to “castrate” the male characters in the film? In her dealings with Walter she is always cool and collected. She has no conscience, no scruples, and hardly any feelings other than greed and frustration. Even her final admission that she is in love with him can be interpreted as a last attempt to save her own life rather than a glimmer of humanity. Presumably, if Walter is touched by her admission and lowers his gun, she can still turn on him and kill him. After all, she did just shoot him a few minutes ago, and what has really changed except the fact that he is now the one with the gun? We have no way of knowing. What we do know is that Phyllis is hardly the oppressed victim in this story. She is not really objectified against her will. She accepts the limitations of society, that official power is all in the hands of men, and she also accepts that she has her own weapons to work with. She is very aware of her own sexuality and of the effect it has on susceptible males. She objectifies and fetishises herself deliberately, in the way she dresses to show off her figure, the way she does her hair, the way she uses jewelry to accentuate her legs, even the way she moves and speaks. She has turned herself into a male fantasy because she knows that the lust of powerful men can get her what she wants. In a way she is almost reminiscent of Vertigo’s Judy as described by Molly Haskell, as a woman yielding to “the deluded and arrogant desire of a man wanting to turn a live woman into a dream”.3 Only in Phyllis’s case she turns herself into a dream to achieve her own desires. She uses her charms to ensnare a rich husband and hide her guilt, and she uses them again to dispose of him and earn a fortune. Her coldness and self-awareness are her power. She is not a slave or a victim, oppressed by frightened and insecure men. She doesn’t need to “castrate” anyone to steal their power. She is not envious of men and she doesn’t want to steal their power because her own power is much greater. The weak and terrified Lola forms a stark contrast to her. Pretty but modest and never shown in a sexually alluring way, she has little if any control over the men in her life, from her father to her rather abrupt boyfriend. In a way however, she is also objectified. She is the sweet innocent flower, the damsel in distress. Any feelings she could have had other than righteous anger and noble suffering would immediately have made her evil. Her weakness is her greatest virtue, her helplessness is what guarantees that she is a good person and deserves happiness. Here Mulvey’s ideas of females in cinema again come into play. A woman can only survive if she is harmless, unintimidating, and vulnerable. As Walter watches Phyllis manipulate him into murdering her husband, and slowly begins to realize that he is just a pawn in her game, his passion turns to fear. He was ready to sink to any depth when he thought he was in control. He thought the crime was his idea, and it was his brilliant execution that made it work. He was the dominant male fighting for possession of a woman that he desired, and who would belong only to him if he was victorious. When he realizes that she has used him, and that she was not buying her freedom to share herself with him, he knows there is only one solution – she must die. In the end, we are meant to identify with Walter. As the narrator, he controls the story and its tone, and places himself in the position of deluded victim. He is every bit as much a murderer as Phyllis. He committed his crime willingly because he thought it would give him something he wanted, just like Phyllis herself. Nevertheless, she gets shot alone in the dark and left dead on the carpet, while Walter gets a sentimental farewell scene and gets to explain his tortured soul to the audience. He is a criminal and the film does not deny that. He fails in his escape plan and will soon face the consequences of what he has done, but the audience is supposed to see this as a tragic fall rather than as the destruction of a dangerous force of evil. In the end, it is not murder that is Phyllis’s gravest crime, but the arrogant assumption that she can defeat a man and bend him to her will. 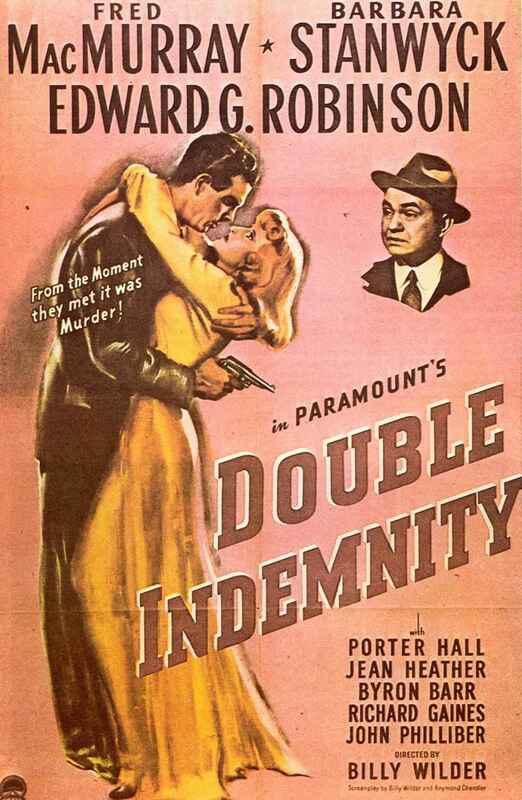 Double Indemnity. Produced by Buddy DeSylva and Joseph Sistrom and directed by Billy Wilder. 107 min. Paramount Pictures, 1944. DVD. Vertigo. Produced and directed by Alfred Hitchcock. 128 min. Paramount Pictures, 1958. DVD. Katherine Blakeney graduated in 2015 with a PhD in Film Studies (PhD) from University of Edinburgh in Edinburgh, United Kingdom.